Adventures of the TV Addict, the Wannabe Writer, and the Should-Be Famous: Happy Veterans Day! So my campus's homecoming is this week and this is one of the posters I found tacked to the bathroom door in my dorm hall. Okay. So...am I the only one who finds this kind of tacky & in bad taste? First off, I want to think it's the US setting up a flag for victory if you can't see it clearly. It's for a homecoming event, a big game of catch the flag. It's just sooo...meh. I dislike. 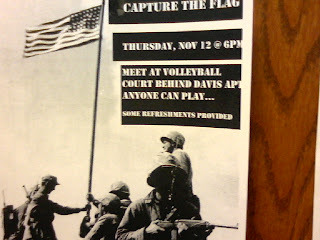 It's kinda tacky that the event happens tomorrow right after Veteran's Day too. Maybe it's a coincidence that this is the only place I've seen it so far.